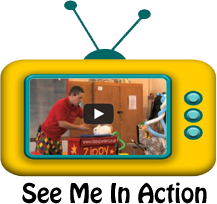 Zippy Junior has over 12 years experience working as a children’s entertainer. He works all over the North West and does many shows in Rainhill. The majority of Zippy’s work comes from repeat bookings and word of mouth. Zippy Junior has many shows and packages available, with plenty of audience participation. Zippy Junior’s parties are high energy, and he always provides the children with exceptional fun and party entertainment. Zippy Junior can also offer excellent entertainment packages for schools, holiday camps, nurseries and playgroups.